AAA Oklahoma urges parents of teens to be proactive during the dangerous 5-year learning-to-drive process. Oct. 19, 2018 – Teen drivers put everyone on the roadway at risk of a deadly crash, especially if teen passengers are along for the ride. 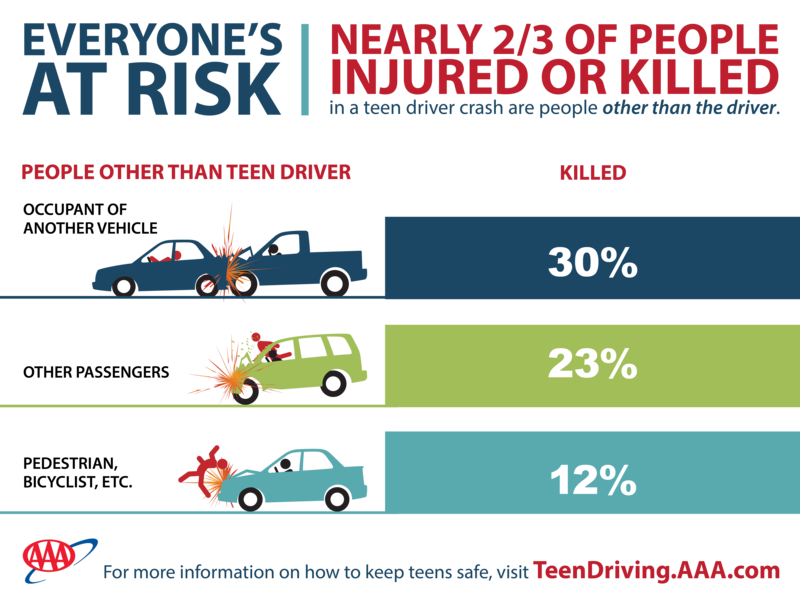 New research from the AAA Foundation for Traffic Safety found that when a teen driver is on the road with only teen passengers aboard, the fatality rate for all people involved in a crash increased 51 percent. In contrast, when older passengers (35 or older) ride with a teen driver, overall fatality rates in crashes decreased eight percent. In Oklahoma, 64 people died in crashes that involved a teen driver in 2016, according to the Oklahoma Highway Safety Office. Teen drivers were involved in 13,910 crashes during the same time, nearly a two percent increase from the previous year. Older Oklahoma teens actually have more wrecks than younger teens, according to the Oklahoma Highway Safety Office’s 2016 data. Involvement in crashes peaked at age 18. Log at least 100 hours of supervised practice driving with a parent before driving solo. Parent-Teen Agreement to set clear expectations and consequences.